Well, the day has finally arrived….it’s official at 12:01 p.m. PRESIDENT BARACK OBAMA!!!!!! I have a confession to make, I am not patriotic. I am not one of those people you will hear defending America. I couldn’t talk about how “great” this country was when all around it, people were being killed for no other reason than being black. People resumes were being thrown into “file 13″ no matter how qualified they were for the job, or there was always some rationale to explain why the black person wasn’t promoted and yet, the white person was qualified to be” trained ” for the position. The Pledge of Allegiance rang as hollow words in my ear…with liberty and justice for all…yeah, right. I think the first time I saw genuine “hope” for this nation was last summer when a young black couple moved into an area known as “old metairie” not too far from New Orleans. Old Metairie is practically all white and was once where David Duke(KKK Grand Wizard) resided. The couple moved there because they wanted an area that was safe to raise their children. Well, the couple went to bed and woke up with KKK and crosses burned into their front lawn. The newpaper ran a story about it and long story short, on the 4th of July, people from all walks of life..Whites, Blacks, Jewish and Asians..about 2-300 people took turns to dig up the hate symbols and plant a new”lawn of love” for them. I was like,WOW. Then, I went to the NOLA blog for that area and the people who lived in the area were blogging things like,”we’re just trying to live in harmony” and how that is the “old way” of thinking and that they don’t want that hate-filled thinking in their area. I was like,DAMN…in old metairie? No, Obama did not give me my first glimpse of “Hope” or “Change”….Old Metairie did. I am sitting here in the comforts of my warm home, looking at the mass of people out there for this day. We thought about going but, me and crowds don’t do well together and I hate being cold so, we decided to stay home and switch to all the different stations and watch everything. Pretty much like I do for Mardi Gras when I don’t HAVE to be out there. It looks like the America of my heart. People from all walks of life, coming together for the good of this country. WE THE PEOPLE is what it looks like to me..finally. Do I think racism is over…NO. I think racism will be here until the second coming. There will always be someone, somewhere who thinks that way. The beauty of it all though is, they are falling deeper and deeper into the minority. As I’ve said before, I’m not patriotic…at least, I wasn’t. I have a feeling that is about to CHANGE. I am beginning to have HOPE for our country in a way that I’ve never had before. Thanks President Obama and thanks to Old Metairie for giving this southern, cynical girl…..a new pair of glasses. 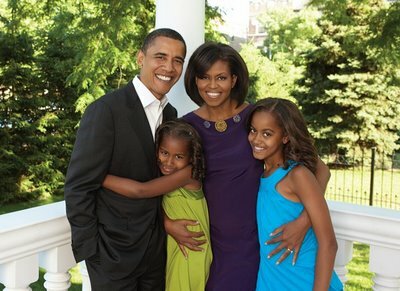 Since it seems that I am going through election withdrawals, I decided to put a picture up of the first family. How beautiful are they? The “pretty people” is what I like to call them. I mean look at these folks, do they ever take a bad picture? How can they looking like that? Nope, just too good-looking. I am so looking forward to hearing about “Rosebud and Radiance” growing up in the White House. Yesterday, we elected the first black President. I can’t feel anything but mad pride for my country. This country has had a legacy of racism far too long and the fact that the American people were able to look past color and elect a black president, speaks volumes about how far we have come as a nation. I think about Martin L. King, Malcomn X, Emmit Till, Medgar Evers, A.P. Tureaud, Dutch Morial, Rosa Parks, and so many, many others who were a part of the struggle and sacrifice to get us to this day. It makes me want to live a better life in a renewed sense. Today, I find myself thinking of those that made it through the middle passage, those who were lynched or tortured and I hope that, their spirits are soaring with rejoice. Not so much because a black man is now president, but because the America that was once enveloped with so much hate is changing, has changed. I am happy for my father who was born during the Great Depression, raised in the deep south under Jim Crow, and served in a segregated military that he lived to see this day. I am happy for my children who can now truly believe that anything is possible if you work hard and refuse to give up. But mostly, I am happy for the United States of America.